Once you've set up and cycled your tropical fish tank to get it all ready for fish, you may feel that it's still lacking a little something. In the early stages of keeping an aquarium, before your plants or corals have had a chance to establish themselves, it can look quite bare. This can be a problem not just for you but also for your tropical fish, who will appreciate having more places to hide and a more interesting landscape to investigate. But adding accessories to your fish tank can potentially cause all sorts of problems, so it's important to know what you're doing. We tend to think of rocks as inert, but in a tropical fish tank that's not the case at all. As soon as you place a rock on the water, it will start to dissolve. This may happen so slowly that you could leave it there for fifty years and still not be able to see the difference, but nevertheless the chemicals which it leaches into the water can have a profound effect on your water chemistry. This isn't always a bad thing. If you're having problems with soft water (which can make it difficult to maintain a stable pH), adding calciferous rocks can redress the balance. Other rocks can provide a useful source of minerals. But many more can make your fish unwell. For this reason it's best to buy your rocks from your local fish shop. This is not expensive and it could save you a lot of trouble later on. You should also go to your local fish shop if you want to get stones to add to the bottom of your tank. These should always be rounded, with no rough edges which could cause injury. Never take attractive pebbles from a stream or beach and add them to your fish tank, as they could carry infectious agents harmful to your fish. 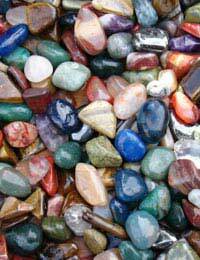 A safe alternative to pebbles are the rounded glass 'stones' you'll find in many home décor shops. Avoid the metallic ones, but plain coloured ones will not harm your fish and can really brighten up your tank. There's a wide range of ornaments out there designed for aquariums. These tend to be especially popular with children. However, you should keep in mind the fact that they're designed to appeal to humans rather than fish, and you should think carefully about your fish's needs before you add them. Make sure that bridges, towers with windows, and similar ornaments don't have holes of a size which your fish could get stuck in. Be ready to remove them if your fish grow so that this becomes a potential problem. Cheaply made plastic ornaments often have rough edges along the line of moulding. File these down so that they don't scratch your fish. Avoid choosing ornaments in colours which may offend your fish. For instance, many male fish become aggressive in response to bright red. Before you add any kind of accessory to your tank, no matter what it is or where it came from, you should leave it for a minimum of twenty four hours in a bucket of water with an antibiotic. Paraguard is a good choice because it also kills parasites. Use a 'dip strength' dose (this should be specified on the bottle). Adding a tablespoonful of salt to the water will also help to kill parasites, unless the ornament was previously kept in salt water, in which case you should keep it in fresh water. Rinse it thoroughly before you add it to the tank. Never transfer accessories between different aquariums without thoroughly treating them as described above. You may think that the donor aquarium is healthy, but you could be passing on an infection which hasn't yet shown symptoms. When treated with the proper precautions, aquarium accessories can be a great addition to your tropical fish tank, giving it a unique character which both you and your fish will enjoy. Hi I have several tropical fish in my tank, 1 silver tipped shark, 2 Elephant-nose dolphin fish, 1 stripped Raphael catfish, i have just added 2 clown locuses, but about half hour after i introduced them into the tank, the bigger one of the elephant-nose fish seems to be harassing them where ever they go in the tank is there a reason for this behavior???? ?